The Journal of the American Medical Association published a paper that described the curious effects of catnip in people. (Yes, people and not cats!) This all-natural herbal product is often added to herbal smoking blends, but it is most-often used to make a tea. Do some research, and then come back to us to purchase this wonderfully pleasant and surprisingly effective herb. 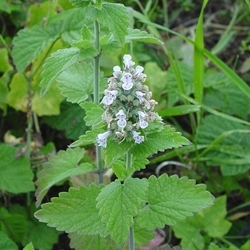 Catnip contains a monoterpene similar to the valepotriates found in valerian root. Manufactured exclusively for us so it can be made into a tea or used as an herbal smoking blend.